Successfully Added Vision 800 3D Video Glasses - Android 4.4, Side By Side Video, 5MP Camera, 1080p Support, Bluetooth, Wi-Fi to your Shopping Cart. Leap into the world or virtual reality with this pair of Android 4.4 Video glasses. Brining blockbuster 3D videos to life wherever you are these 3D video glasses support 1080P images and the 700x540 screen resolution bring great depth and color that simulates sitting in front of large 80 inch screen. To complete the experience the Vision 800 video glasses have stunning quality earphones so you can really shut out the world and immerse yourself completely in the 3D entertainment. When playing 3D side by side videos you will feel as though you're in the centre of the action and can enjoy the total 3D experience on the go or in the comfort of your home. 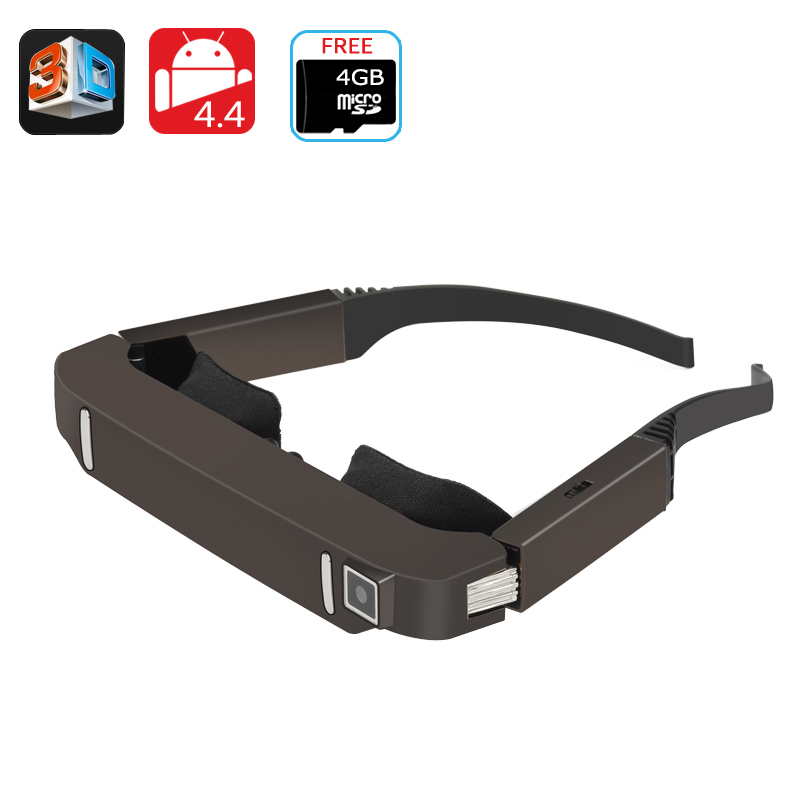 The glasses use a quad core MTK6582 processor and 1GB of RAM with the Android 4.4 operating system you can do a whole lot more than just watch videos. The Bluetooth support lets you connect wirelesses controller such as a mouse keyboard or game pad so you can work away in your virtual office or take control in 3D gaming. With Wi-Fi connectivity you can tap into the world wide web and updated your social media, download movies or surf web pages all on a large screen, without disturbing anyone around you. Like the Google Glass these cool, VR glasses have a built in camera so you can snap shots and record video when wearing them and review the images and footage directly through the glasses. A built in battery offers this VR headset up to 3 hours of play time which is ample time for a feature length 3D blockbuster and a great way to pass the time on those long journeys or flights. The Vision 800 3D VR Glasses come with a 12 months warranty, brought to you by the leader in electronic devices as well as wholesale 3D Glasses..